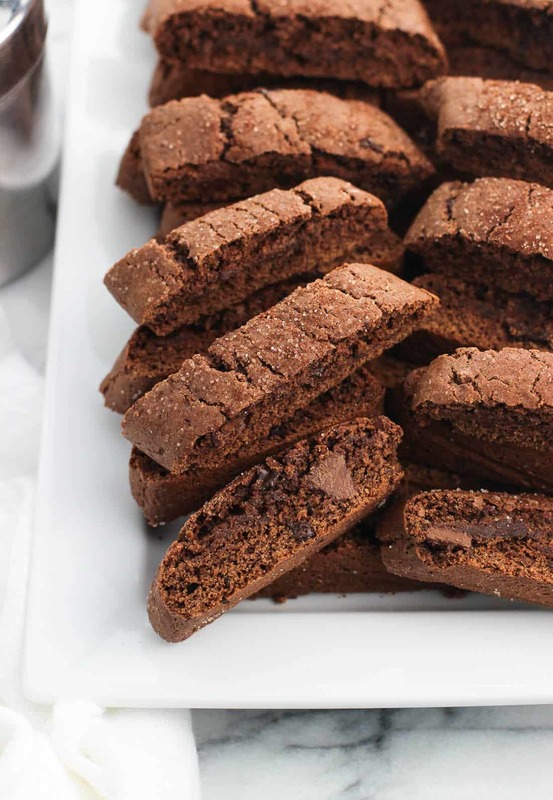 Mini Mexican Chocolate Biscotti are deep chocolate-y biscotti with a bold spice flavor coming from ground cinnamon and cayenne pepper. Topped with cinnamon sugar, these bar cookies are a great pairing for a cup of coffee or as a part of holiday cookie trays. In classic ‘me’ fashion, these Mini Mexican Chocolate Biscotti are coming to you a few weeks ahead of schedule. I’m not the most patient person (might be an understatement), but I made these thinking they’d be great Christmas cookies and that I’d save the recipe until at least early November. The longer I thought about it the more it seemed silly to wait, because really, would anyone complain about having a spiced chocolate cookie recipe not overtly-holiday in nature earlier than later? Probably yes they would because this is the Internet after all, but I’m willing to take the heat. Biscotti are one of the first baked goods I got hooked on making when I was discovering my love for cooking/baking. They’re a versatile cookie perfect both for dunking in coffee or hot chocolate and munching on by themselves, and they’re hardy and hold up if being mailed. 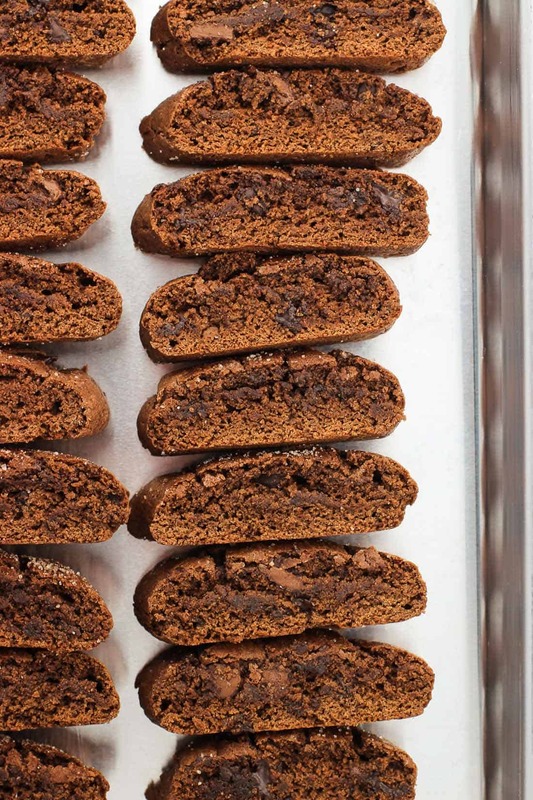 I always include biscotti in holiday cookie packages I send to family and friends because I don’t worry as much that they’ll arrive in crumbs as I would with, say, dark chocolate pizzelle. Those are more of a hand-deliver type of cookie. 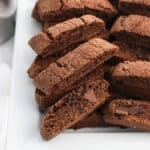 There are a ton of biscotti variations out there, from classic versions flavored with almond/anise to chocolate-dipped/drizzled ones to all flavors in between, but one thing remains the same – their baking method. Biscotto, which is the singular form of biscotti, means “twice-cooked” in Italian. Once shaped into logs of dough, the biscotti are baked enough to firm them up without becoming too crumbly. You’ll slice the dough logs into strips (forming individual biscotti) and place the biscotti on their sides (cut sides up/down) to bake again and harden. And there you have it – twice cooked. 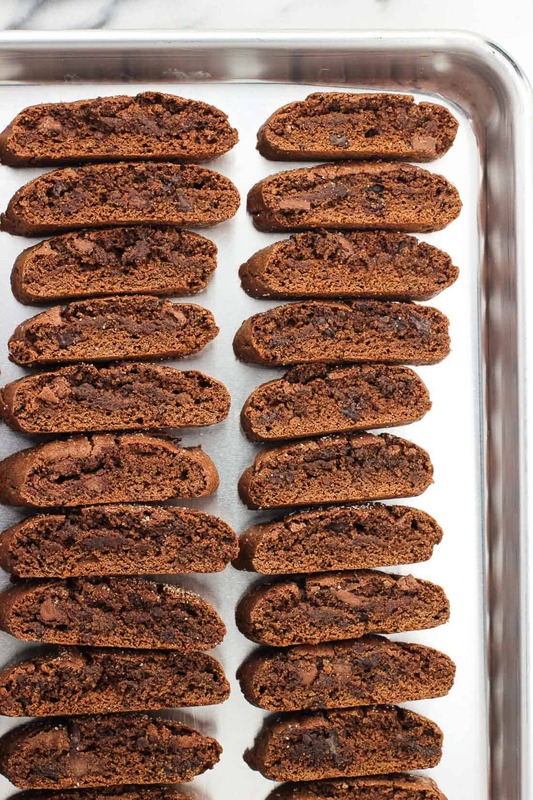 I based these Mini Mexican Chocolate Biscotti off of my Triple Chocolate Biscotti recipe, which yields larger, non-spiced biscotti drizzled in chocolate. 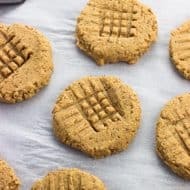 Those are delicious, however in my opinion smaller cookies work better for cookie trays as you don’t have to commit to just one or two types of cookies. Smaller and mini cookies means you can sample more varieties of cookies without overeating. Perfect! If you’ve ever encountered a super dry, break-your-teeth type of biscotti, I will say that these biscotti are not like those biscotti. While these are dry and crumbly like biscotti should be, they are a bit softer to bite through – not rock hard. They’ll for sure hold up to dunking, but dunking isn’t mandatory to prevent you from chipping a tooth. And I can’t believe I went this long in the post without mentioning the flavor! I’ve always been intrigued by Mexican hot chocolate recipes that feature cinnamon and chiles or peppers. Peppers in dessert? 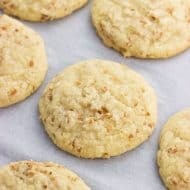 White ground pepper works wonderfully in pfeffernusse cookies, but cayenne is a step or two or five above that. 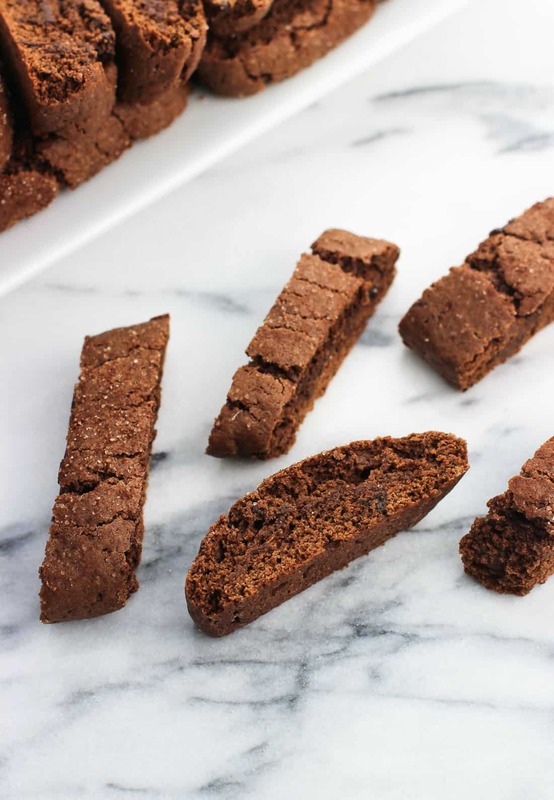 Turns out the cinnamon and cayenne add a bold but not overwhelming spiced flavor to these Mexican chocolate biscotti. You won’t go running to down a glass of water as you might when eating savory food spiced with cayenne, as I find the chocolate-y sweetness counteracts that abrasive ‘spiciness’ aspect. If you’re still a little skeptical see the recipe note below on reducing the cayenne. As written, this recipe features a bold, warming flavor from the ground cayenne. I would not go over the 1/4 tsp plus 1/8 tsp ground cayenne quantity in the recipe card as the flavor might be too overwhelming if you do. If you’re skittish with cayenne I’d say stick with adding just 1/4 tsp. Depending on your preference, you may want to use a serrated or non-serrated knife to slice the cookie logs into biscotti. I prefer to use a non-serrated knife as I find it produces less crumbs as you cut through them, but take a few test slices with either to see which one you prefer. Use your favorite variety of chocolate chips or chunks. I was using up the last of my stash of chocolate and mixed in a combination of dark chocolate chunks and semi-sweet chocolate chips to make up the 3/4 cup. Preheat oven to 375°F. Grease two large baking sheets with butter or cooking spray, or line them with parchment paper. Set aside. Add melted butter, sugar, eggs, and vanilla extract to a large mixing bowl and beat until smooth. Add flour, cocoa powder, baking powder, ground cinnamon, and ground cayenne and mix in until all combined, taking care not to overmix. Divide dough into four equally-sized sections. Shape each section into a long, thin log (mine were approximately 10" long, 2" wide, and 1" tall) and place on baking sheets. I put two lengthwise on each baking sheet, keeping a few inches of space between them. Sprinkle tops with cinnamon sugar. Bake for 14-15 minutes, then remove the baking sheets from the oven. Using a sharp knife, slice logs into 3/4-inch long strips on the diagonal. Place each biscotti cut-side down on the baking sheet and put back in the oven. Bake for another 5-6 minutes to allow the sides to crisp up. Let cool on the baking sheet for a few minutes, and then transfer to a wire rack to cool completely. 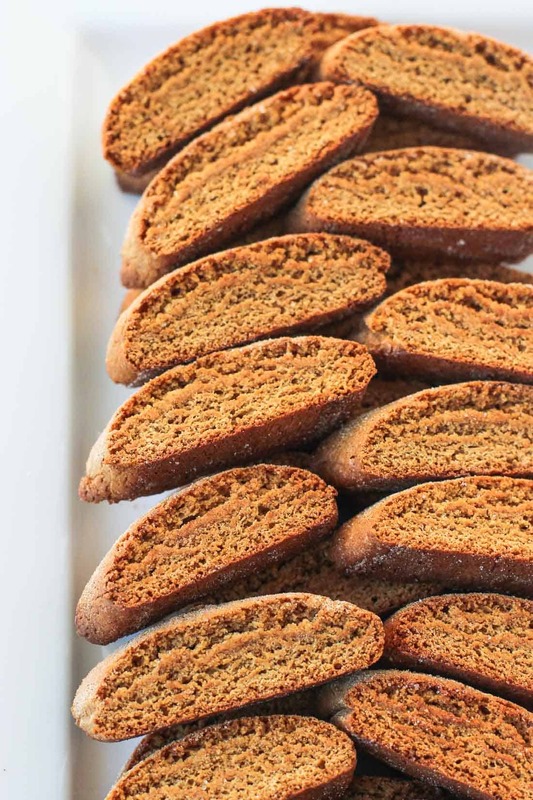 You may also like these Mini Gingerbread Chai Biscotti as a fun + festive holiday dessert!